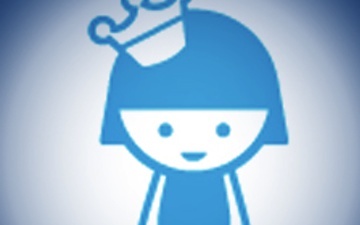 There are more than 8 million users on Foursquare — up from just 1 million a year ago. This explosive growth means one thing — you might want to get your business on Foursquare. After all, Radio Shack reported that the average Foursquare user spends 3.5 times more at its retail shops than the average customer. The most recent iteration of the location-based app, Foursquare 3.0, expanded the features and made it much easier for businesses to jump on the bandwagon and start marketing. Best of all, it’s free. Foursquare is winning the location-based app game because it has the biggest user base [aside from Facebook Places] and it pleases both parties — customers want to be recognized, and businesses want to know who their biggest fans are. Mashable spoke with Eric Friedman, Foursquare’s director of business development, about how businesses can get started on Foursquare and the various marketing options they have available to them. “Foursquare works well when a moment of commerce happens,” says Friedman. And commerce is exactly what business owners are looking for. Plus, as smartphones penetrate the U.S market (currently, about a third of U.S. consumers have a smartphone), there will be even more Foursquare users. Want to get started? Below, Friedman walks Mashable through all of the steps. “[Small businesses] have the same resources available to them as a super large QSR, an Italian restaurant or a Starbucks, and that’s a really powerful tool,” says Friedman. He’s referring to the Foursquare for Business Merchant Platform, which creates an even playing field for restaurants, retail stores, museums, mom-and-pop shops and other businesses. 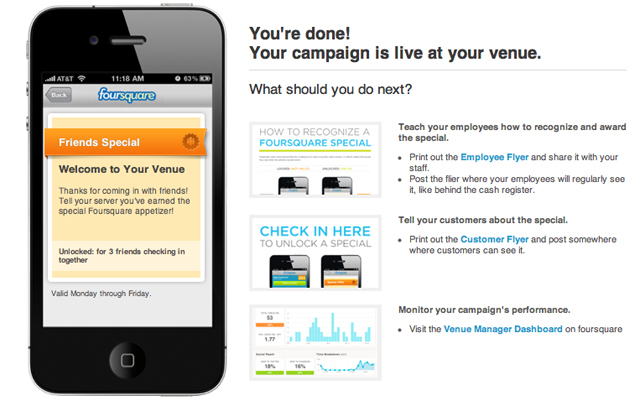 The owners can claim venues on Foursquare, establish specials and analyze data on Foursquare’s dashboard. Here’s how to do it. To claim your venue, search for it on Foursquare.com. It’s likely that someone has already created your venue to check into it, and you can claim it by proving that you own it. If you can’t find it or you are opening a new venue, click “Add a new venue to Foursquare,” which is at the bottom of the page. Fill out the information in the wizard. Once all the information is plugged in, your venue page will come up. Click “Claim here” on the venue page. Swarm Special. A special is unlocked when a certain number of people are checked in. For example, an ice cream store can give away a free scoop of ice cream when 10 people are checked in at once. You can set a limit for how frequently this special can be unlocked so that you don’t give away too much product. Friends Special. A reward for when friends check in together. You can specify how many friends need to be checked in and what they receive for being checked in. Flash Special. A special for the first X people who come at X time. It’s great way to incentivize customers to stop by during your slow hours. Newbie Special. A reward for people who check in to your business for the first time. Offering a reward for a user’s first checkin — even if it’s a small one, like 10% off or a free side dish — is a great way to start a relationship with a new customer. Check-In Special. A reward for every single checkin. Restaurants can offer a free soda or a discount, while retailers might offer a few dollars off a purchase. Loyalty Special. A reward for a user’s third, fifth, seventh checkin — you determine the interval — to incentivize customers to return a few times to cash in on their special. Loyalty specials can be recurring (“every three checkins”) or not (“on your third checkin”). Mayor Special. The mayor is the person who has checked into a venue more than anyone else. In theory, he is your best and most loyal customer. As such, he deserves a prize, whether it’s a discount, a free t-shirt, a beer or a meal on the house. Mayors tend to be proud and protective of their mayorship, and you might even see some turf wars when the mayorship changes hands. You can offer something whenever a new mayor earns the crown, or you can offer a daily reward for the mayor. Now that you’ve seen the offerings, click the special you’d like to do and fill in the requirements for unlocking the special. Once you finish entering the stipulations and select what venues will feature the special, it will be live (though it won’t show in the “Nearby Specials” filter until a human verifies that the special is legitimate). 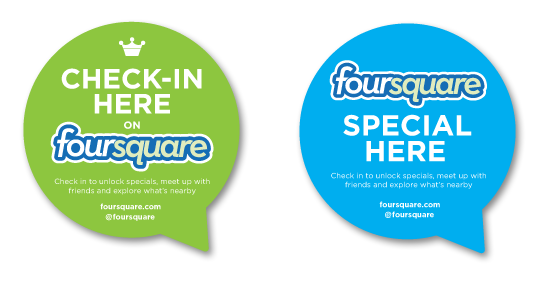 There are two one-sheets you can print off to explain Foursquare — one for employees, so they know how to recognize a special, and one for customers, so they know how to get in on the Foursquare action. 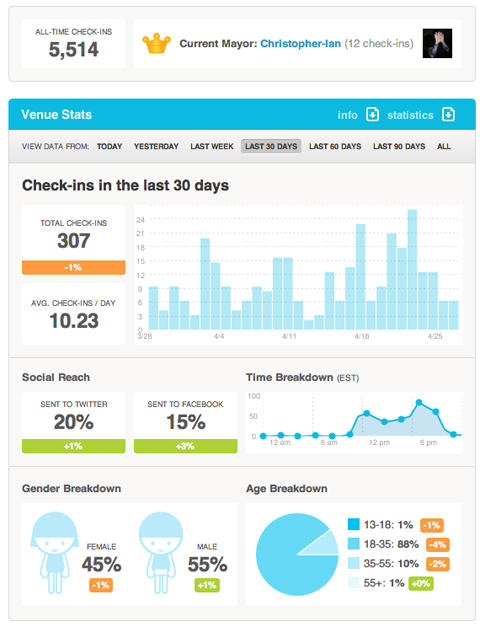 Once you’ve claimed a venue, you can access a dashboard of analytics that show how many checkins you’re getting each day, the time of each checkin, as well as a breakdown of the genders and ages of your Foursquare customers. Plus, there are two lists: one of your top visitors in the past 60 days (your most loyal customers), and one of your most recent customers, along with their Twitter handles (so long as they provided that info when they logged into Foursquare). In my experience, only about 25% of people push their Foursquare checkins to Facebook and Twitter, so having access to the Twitter handles of loyal and new customers provides businesses with an opportunity to reach out, follow up and see how a customer’s experience was. That personal touch is likely to bring customers back, and it may also turn that person into an evangelist for your business. 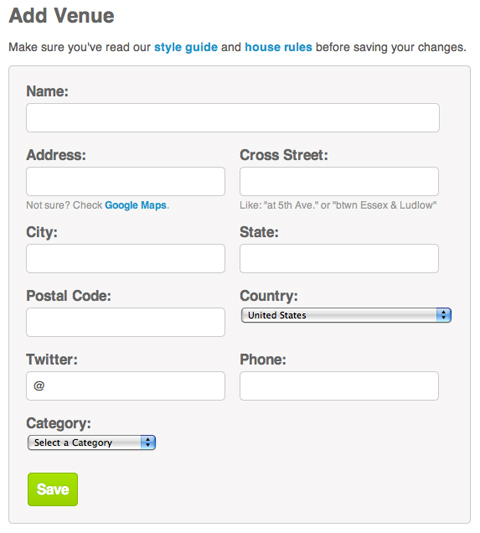 Also, remember that Foursquare is flexible, and you can make changes in real-time. You can run two specials simultaneously at each venue, so experiment and figure out what works for you and your business. With the right campaign, you could actually be saving money — Friedman says several business have stopped advertising altogether, since Foursquare allows them to reach customers for free. But not every business has a brick-and-mortar location — look at MTV and Zagat, for example. If your company is a brand without a physical presence — a magazine, a TV channel, a university of a consumer packaged good — you can use Foursquare Pages and Partner Badges to reach consumers. Foursquare Pages are “a place for brands to have a program and have a cool way to interact with consumers,” Friedman says. 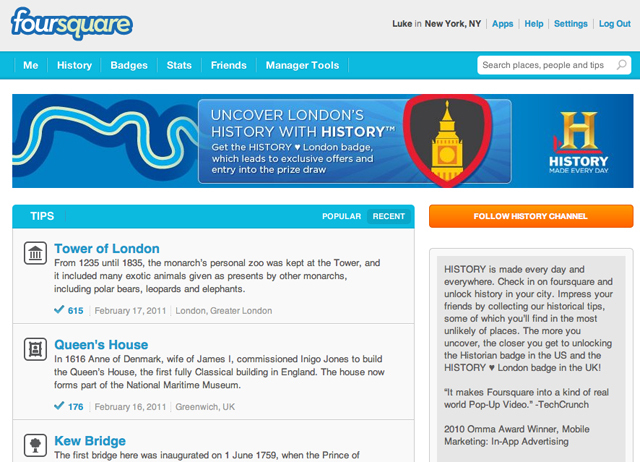 The Foursquare website outlines a step-by-step process for setting up a Foursquare Page, which must be done manually (in the future, businesses will be able to create their own brand Pages). Business owners must submit a form; the Foursquare team will reply in about two weeks. Your Page is highly customizable, and you can have a custom banner to incorporate your logo. The grey box on the right can be populated with information about your brand, along with links back to your own site or to social media sites. And of course there are tips you can leave for your followers so that when they check in to certain places, your tip pops up. The History Channel leaves factoids all over the country at places like New York’s Highline and London’s Tower Bridge, which provide context as you traverse the city. Likewise, Zagat leaves restaurant tips for dishes and cocktails. Tips can direct people to a certain place or instruct users to try a certain item. The point of Foursquare is to enhance someone’s experience in a location — if you have some insights, share them. Crunked. Four stops in one night. Photogenic. Checking in to three places with a photo booth. Swarm. Checking in to a place with 50 other people. MOMA — Art Addict. Three checkins at MOMA or PS1 in one month. The Wall Street Journal — WSJ Lunch Box. Two checkins during lunch at a restaurant that’s been reviewed in WSJ’s “Lunch Box” column. Gogo Inflight — Mile High. One checkin while in flight. 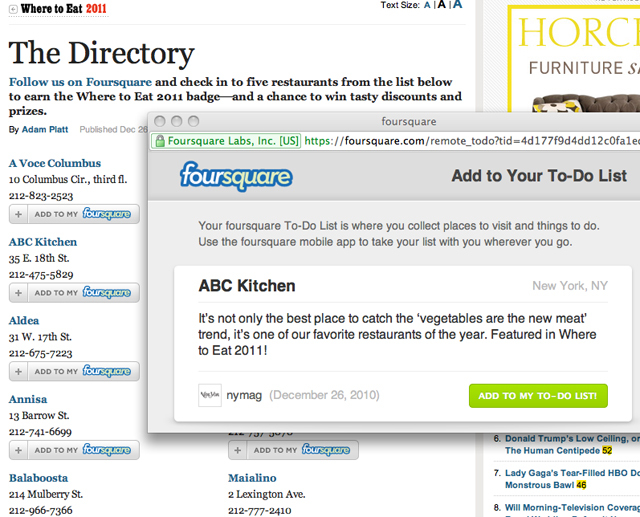 New York Magazine recently did a Foursquare integration with its “Where to Eat 2011″ feature. Below each highlighted restaurant, users could add a restaurant tip to their to-do lists. Checking in to 5 of the restaurants in the list earns a user the Where to Eat 2011 badge, which could also unlock discounts and prizes at these restaurants. The best kind of Foursquare specials are those that make users feel, well, special. You don’t need to give a discount and lose your margins. Offering exclusive access to a sample sale or a special dessert that is only available for Foursquare users is a great way to get people coming back and checking in. Plus, not offering discounts means you can attract and maintain customers without affecting your bottom line. Remember to utilize the fine print when you’re filling out your special. 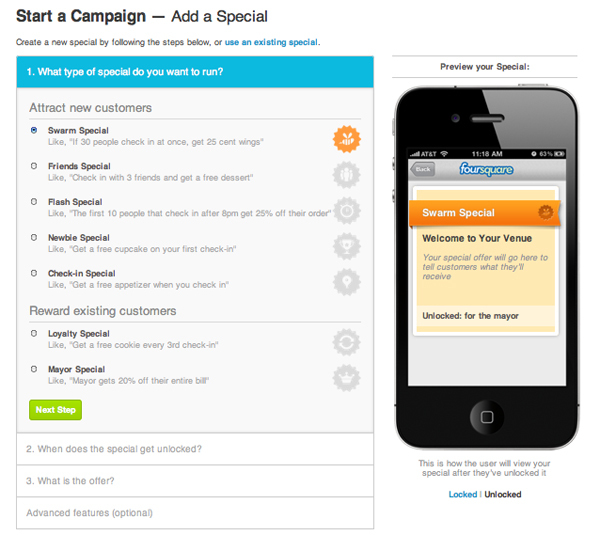 Use Foursquare to grow your business — run a special during your slow times to keep a steady flow of customers all day. 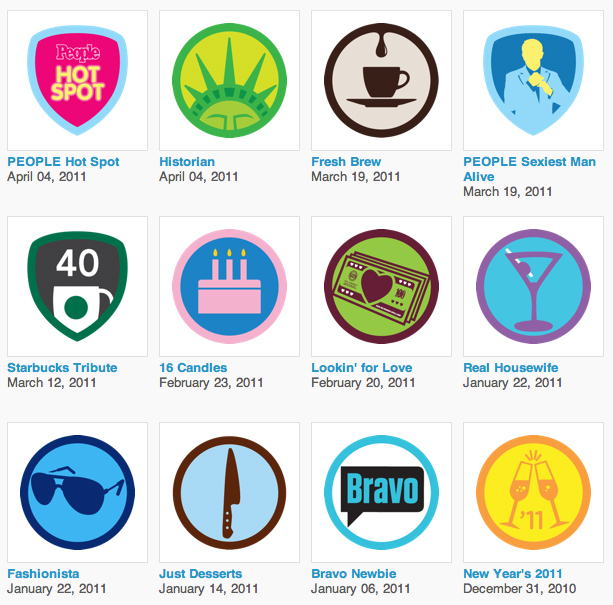 Make sure you train your staff on how to recognize and reward Foursquare users. Remember to set an end date for a campaign if it’s a limited-time offer or a one-day special.